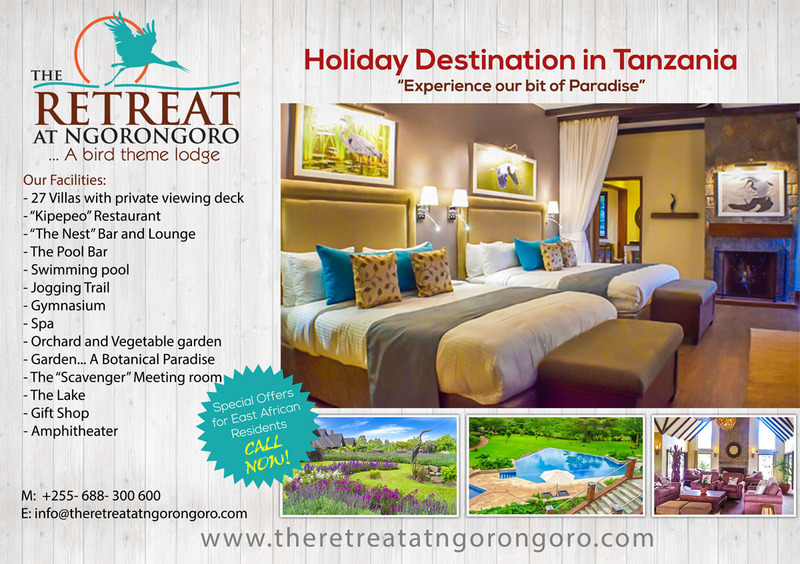 The Retreat at Ngorongoro is a meticulously themed lodge set within 30 acres of land with clear emphasis on nature and birdlife in the area. As you walk around the lodge, you will be amazed at how nature has been integrated into this development. Due consideration has been made to ensure that space, privacy and close to nature experience is enhanced. Due to our convenient location, one can easily undertake visits to Lake Manyara national park, Lake Eyasi area and Ngorongoro crater. On this basis, at the very least, one can plan a 3 nite stay at our lodge. Relax within the lodge’s 15 acre immaculate gardens and forest. Take a guided walk through to Ngorongoro Forest where you will get to visit a real rainforest and waterfalls. Enjoy the birdlife around the lodge.